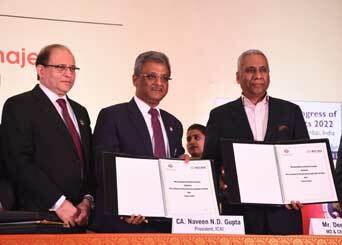 New Delhi: The Institute of Chartered Accountants of India (ICAI) has signed an Memorandum of Understanding (MoU) with the Invest India on February 4, 2019 coinciding with Platinum Jubilee Annual Function of ICAI at New Delhi under the aegis of the Committee for Export of CA Services & WTO of ICAI. The MoU was signed by CA. Naveen N. D. Gupta, President, ICAI and Mr. Deepak Bagla, Managing Director and CEO of Invest India. Mr. Rajiv Mehrishi, Hon’ble Comptroller and Auditor General of India, CA. Prafulla P. Chhajed, Vice-President, ICAI, CA. Babu Abraham Kallivayalil, Chairman and CA. Anil Bhandari, Vice-Chairman of the Committee for Export of CA Services & WTO of ICAI were also present. The objective of the MoU is to collaborate and promote foreign investment in India and Indian investments outside India. The MoU also intends to provide necessary guidance and advice to the potential inbound and outbound investors and to promote and facilitate India as an investment friendly destination. Signing of the MoU between ICAI & Invest India would promote foreign investment in India by giving necessary guidance and advice to potential investors on the regulatory compliances for investment in India. The ICAI through its member network across the globe would give necessary assistance in this regard especially relating to accounting, taxation, legal and advisory services and to facilitate formation of appropriate investment vehicle etc. This initiative would further assist in promoting innovation, start up India initiatives, investment facilitation across globe, creating job opportunities and alike relating to Accounting & Finance Services identified under Champion Sector by Government of India. ICAI intends to facilitate Invest India in resolving investment-related queries from both domestic and international companies including financial investors, and Start-Ups regarding information on applicable legislation and regulations, process of filing applications and helping them to meet other procedural and regulatory requirements to the extent possible. Both parties will organize investment promotion events including road shows and investor outreach programmes across the globe. They will jointly organize webinars, training programmes, events, seminars on investment-related topics across various sectors of the Indian economy to help promote investment and facilitate interactions between international investors and Indian business community.